The story behind the 1952 Ford Bus is that a few year ago friend of mine posted a picture of herself in one in some salvage yard somewhere. Something like that. And the man saw the image of the bus coveted the bus. He wished to purchase the bus and restore the bus and then, I guess, travel around the country in the bus. The bus echoes in his memory. The bus seems to represent some kind of idyllic dream. As far as crazy ambitions go, I’d rather the bus than a skydiving school. 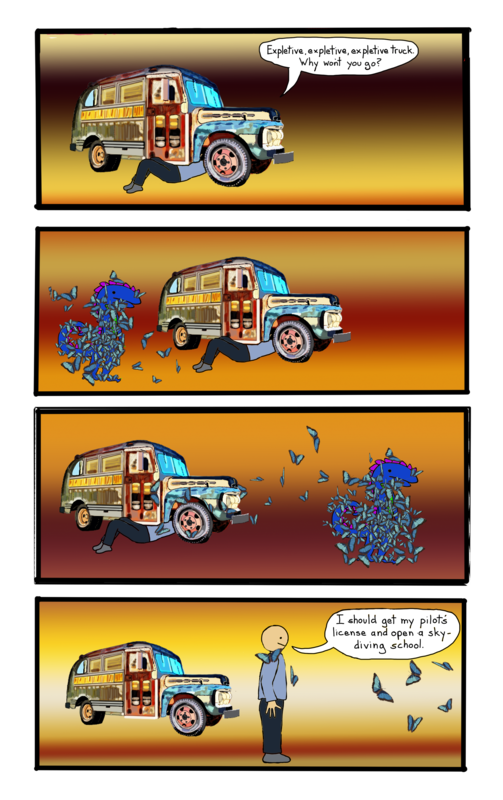 This entry was posted in Comics, dragon, dragon comics and tagged 52 ford bus, blue morpho, butterfly, comic, dragon, webcomic on March 11, 2015 by littledragonblue. Yes, indeed–hilarious! I love it. Also love the multi-coloredness of the bus. Keep it coming. The bus did come out pretty well. I might do a more detailed version for a T-shirt.